"America's Most Honored" is a recognition program created by American Registry. American Registry is expert in business recognition evaluation. Like all professionals included in American Registry’s comprehensive database, these honorees have received mulitple honors by recognized trade groups, and/or acclaimed recognitions by peers or clients. 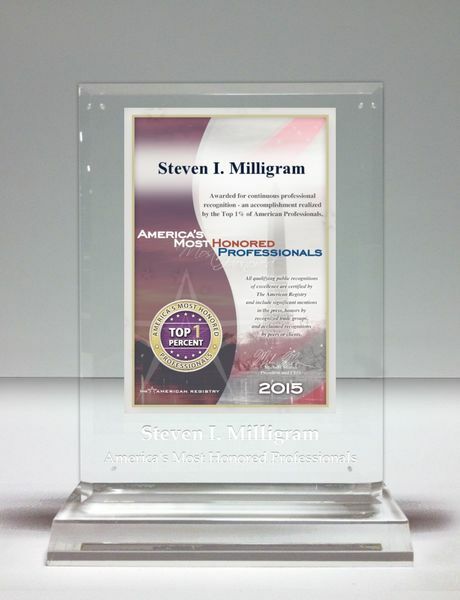 Steven I. Milligram has received their prestigious Top 1% Award for America's Most Honored Professionals 2015. This award is not limited to lawyers like Steven Milligram, but all professionals including CEO's, doctors and more. American Registry issues awards for "Most Honored Professional" for individuals in the top ten, top five and top one percent. The Top 1% Award is an achievement considered by American Registry to be one of the most dignified of any individual recognition. More information on this award is available at the American Registry website.